Wow, I've had this page up since like 1998, a lot has changed in computer hardware and bandwidth since these clips were first created. The original breakdown was 'Old School' (80s) and what was at the time 'New Style' (mid to late 90s!) - then I added some clips from the Soul Caliber video game (which is now kind of outdated), as well as some other random clips worth checking out. I thought I'd reorganize things a little bit and add a 'New-new school' section, affectionally known as 'Funky Fresh,' which is stuff from the 2001 9th All China Games. You'll notice the new ones are a lot bigger then the old ones, just a sign of the times, bandwidths get higher, picture quality and clip length improves! There are now a lot of wushu websites with video clips, Furiousg.com is the largest of these. So if you get through all these here, and if you have a fast enough connection, don't worry, there's plenty more out there. The old clips are in Quicktime format. I suggest you download the lastest version of quicktime if you have any problems. If it still doesn't work, try to find someplace to get more Quicktime Codecs, don't email me to ask, I don't know of any though, ok? The newer VCD trailers are all in MPG format, everyone should be able to view these no problem. The latest videos I've added are in DIVx AVI format. To view them, you'll need to download the DIVx Codec. I'm going to try and utilize outside server space whenever possible, so if you're having problems downloading, it might be that these servers are having difficulties. I'm going to try and add thumbnails for all these clips. Hao Zhi Hua (1.5 Mb - MOV) - This clip from the 1981 or 1982 China Nationals shows Beijing Team champion Hao Zhi Hua, aka Patti Li performing Double Broadsword. Notice that her fly outfit is the same one she is wearing in the Old School Beijing Team posters available from Chinese Wushu Resources. This clip has narration in Mandarin, subtitles which are barely readible in English and some unidentified European language. An added bonus is the fake wushu soundeffects! Jet Li and the Virtual Wushu Coach (2.2 Mb - MOV) - Yes, you read that right! Pre-Wong Fei Hong Jet Li is recieving some coaching from the pre-cyborg Virtual Wushu Coach! Also another incredibly old Wushu master busts out some Tai Chi. Check out the fresh gear that Jet is wearing. He was stylin' way back in the day! Again, this is in Mandarin with subtitles. 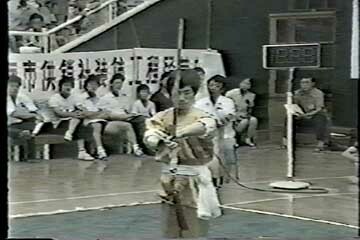 Li Zhizhou (4.6mb - DIVx AVI) - Original Beijing Team member, performing Drunken Straightsword at the 86 China Nationals. Lu Jin Ming (650k) - You may know him better as the Beijing Team Men's Coach, but in fact he is a Beijing Team old schooler from back in the day too. This is a short clip of him performing broadsword. Xue Xing Fu (430k - MOV) - Beijing Team Women's coach during their '95 visit -- Beijing Team member in the '80s. Xue Xing Fu is chopping some major booty in this clip (and not just because of the added sound fx). Yang Shiwen (4.8 Mb - DIVx AVI) - from the 1986 China Nationals, Nan Quan King Yang Shiwen, of the Guangdong team. Like all great Southern Fist Kings, this guy is no longer with us. Word is that he died a few years back from carbon monoxide poisoning. He is definitely one of a kind, check out those shoulders! Yu Shao Wen (800k - MOV) - From the same tournament as the Patti clip, with the same bad sound effects. This is Yu Shaowen, Beijing Team member now teaching in Portland, Oregon. He is performing broadsword. And you just thought he did monkey fist? Su Tongyun (4.0 Mb - DIVx AVI) - from the 1986 China Nationals, a terrificly fast and smooth performance of the 9 section whip. Zhang Hong Mei (4.8 Mb - DIVx AVI) - from the 1986 China Nationals, performing double straightsword, an event that she won several national titles in. The narration is in Mandarin, and there are no phoney sounds added. (This is a much better copy of the old Zhang Hongmei clip that used to be here). Zhang Xian Ming (MOV) - You may know him better as the Beijing Team Women's Coach. This is what he did Back In The Day. Just to one up his collegue, he's bustin' out the double broadsword. Zhao Changjun - 1 (4.1 Mb - DIVx AVI) - Also from the 86 nationals, many time all-around champion performing changquan. Unidentified Fujian Team Member (1.7 Mb - DIVx AVI) - from the 1986 China Nationals, a rare performance of Dishuquan, aka Fujian Ground Boxing. Kong Xiang Dong (1.2 Mb - MOV) - This clip of one of my favorite Beijing Team member is from the summer of '94. Taken at the Beijing Team's workout by none other than Dan 'The Man' Wu. Kong Xiang Dong, looking cool in his red sweatpants, is tearing it up with on the spear, and you thought he just did Tai Chi? Who's the Blacksheep? Han Jing (1.2 Mb - MOV) - Han Jing, of the Beijing Wushu Team performing bagua zhang, 8 diagram palm, known for its circular stepping and lightning quick moves, she really is spinning Around The World. From the 1998 Women's National Individual Competition in Beijing China. Ka Li (1.4 Mb - MOV) - The Souther Saber, as performed by this former Nan Quan champion of China at the 1996 National Men's individual competition. Beijing Team Women's Sparring Set (MOV)- Sparring Set as performed by the women of the Beijing Wushu Team, Wang Xiao Na, Liu Qing Hua and Han Jing from the 98 Women's competition. Beijing Team Jumpkicks (2.9 Mb - MOV) - From Summer 1994, The Beijing Team practices some jump of their basic jump kicks. Di Tang (2.0 Mb - MOV) - Amazing Di Tang Quan, ground fall boxing, performed by someone who's name I can't find, at the 1996 Men's Individual championships of China. Broadsword Excerpt (6.2 Mb - MPG) - A brief excerpt from Vol 2, this is just the end of Wang Xiao Na's broadsword routine, followed by the beginning of Wang Rui's. Straightsword/Spear Sampler (9 Mb - MPG) - A few clips of athletes competing in Straightsword-Spear, in order, its Zhang Jidong, Zhao Yangyang, Li Ao, Liu Qinghua, Jiang Bangjun and Shi Kun. Taiji Sampler (7 Mb - MPG) - Just a few of the athletes featured on volume 5. Straightsword/Spear Sampler (8 Mb - MPG) - The coup d'gras, if this can't make you excited about the VCD, then you might not have a pulse. Kong Xiangdong Controversy (5.6 Mb - MPG) - A clip made to show the distracting yell some jerk in the audience made to mess up Kong Xiangdong during his taijiquan form at the All China Games. (Click here to read more about this). Sichuan Team Sparring Set (AVI)- One of the two men's teams competing in the sparring set division at the 9th All China Games. Karate Chimp (2.9 Mb - MPG) - I don't know who this chimp is, or where this video came from, but its pretty awesome. Check it out!